The paracellular route is the dominant pathway for passive solute flow across the intestinal epithelial barrier, and its permeability depends on the regulation of intercellular tight junctions (TJs), also known as the zonula occludens. As a barrier between apical and basolateral compartments, TJs selectively control the passive diffusion of ions and small water soluble solutes from the intestinal lumen to the bloodstream through the paracellular pathway, thereby counterregulating any gradients generated by transcellular pathways.1 Variations in transepithelial conductance can usually be attributed to changes in the permeability of the paracellular pathway as the resistance of the plasma membrane of the cell is relatively high.2 The TJ represents the major barrier within this paracellular pathway and the electrical resistance of the intestinal mucosa seems to depend on the number of transmembrane protein strands and their complexity within the TJ, as observed by freeze fracture electron microscopy. A century ago, TJs were conceptualised as a secreted extracellular cement forming an absolute and unregulated barrier within the paracellular space.3Biological studies of the past several decades have shown that TJs are dynamic structures subjected to structural changes that dictate their functional status under a variety of developmental,4-6physiological,7-10 and pathological circumstances.11-13 To meet the many diverse physiological challenges to which the epithelial and endothelial barriers are subjected, TJs must be capable of rapid and coordinated responses. This requires the presence of a complex regulatory system that orchestrates the state of assembly of the TJ multiprotein network. While our knowledge on TJ ultrastructure and intracellular signalling events have significantly progressed during the past decade, relatively little is known about their pathophysiological regulation secondary to extracellular stimuli. Therefore, the intimate pathogenic mechanisms of diseases in which intestinal permeability is affected and the utility of TJ modulation for drug delivery both have remained unexplored owing to limited understanding of the extracellular signalling involved in TJ regulation. In recent years much has been discovered about the structure, function, and regulation of TJs. However, the precise mechanism(s) through which they operate is still incompletely understood. Several microorganisms have been shown to exert a cytophatic pathological effect on epithelial cells that involves the cytoskeletal structure and TJ function in an irreversible manner. These bacteria alter the intestinal permeability either directly (that is, EPEC) or through elaboration of toxins (that is, Clostridium difficile, Bacteroides fragilis).14 A more physiological mechanism of regulation of TJ permeability has been proposed for the zonula occludens toxin (Zot) elaborated byVibrio cholerae. 15 16 Zot possesses multiple domains that allow a dual function of the protein as a morphogenetic phage peptide for the Vibrio cholerae phage CTXφ and as an enterotoxin that modulates intestinal TJs.17 The discovery of Zot has shed some light on the intricate mechanisms involved in the modulation of the intestinal paracellular pathway. Zot action is mediated by a cascade of intracellular events that lead to a protein kinase C (PKC)α dependent polymerisation of actin microfilaments strategically localised to regulate the paracellular pathway (fig 1).18 The toxin exerts its effect by interacting with a surface intestinal receptor whose distribution varies within the intestine, being detectable in the jejunum and distal ileum but not in the colon, and decreasing along the villous-crypt axis.19 This receptor distribution coincides with the regional effect of Zot on intestinal permeability19 and with the preferential F-actin redistribution induced by Zot in the mature cells of the villi.18 These data also suggest that expression of this receptor(s) is upregulated during enterocyte differentiation. This hypothesis is supported by the observation that human intestinal epithelial CaCo2 cells (that resemble the mature absorptive enteric cell of the villi), but not crypt-like T84 cells, express this receptor(s) on their surface.20 The paucity of Zot binding in the crypt area may also reflect the fact that this region is already leaky compared with the more mature epithelium of the tip of the villi21 and thus might not need to express a significant amount of a putative receptor(s) involved in TJ regulation. Proposed zonulin/zonula occludens toxin (Zot) intracellular signalling leading to the opening of intestinal tight junctions. Zonulin and Zot interact with the same specific surface receptor (1) whose distribution within the intestine varies. The proteins are then internalised and activate phospholipase C (2) that hydrolyses phosphatidyl inositol (3) to release inositol 1,4,5-tris phosphate (PPI-3) and diacylglycerol (DAG) (4). Protein kinase C (PKC)α is then activated (5), either directly (via DAG) (4) or through release of intracellular Ca++ (via PPI- 3) (4a). PKCα catalyses the phosphorylation of target protein(s) with subsequent polymerisation of soluble G-actin to F-actin (7). This polymerisation causes the rearrangement of the filaments of actin and the subsequent displacement of proteins (including ZO-1) from the junctional complex (8). As a result, intestinal tight junctions become looser (from Fasano32 with permission, modified). Taken together, these data showed that Zot regulates TJs in a rapid, reversible, and reproducible fashion, and probably activates intracellular signals which are operative during the physiological modulation of the paracellular pathway (fig 1). Based on this observation, it was postulated that Zot may mimic the effect of a functionally and immunologically related endogenous modulator of epithelial TJs. The combination of affinity purified anti-Zot antibodies and the Ussing chamber assay allowed the identification of zonulin, an intestinal Zot analogue.22 23 Zonulin has a molecular weight of 47 kDa, an N terminal receptor binding motif that is structurally and functionally similar to the Zot binding motif,22 and a C terminal domain probably involved in the rearrangement of cytoskeletal elements functionally connected to intercellular TJs. The physiological role of the zonulin system remains to be established but it is likely that this system is involved in several functions, including TJ regulation responsible for the movement of fluid, macromolecules, and leucocytes between the bloodstream and the intestinal lumen and vice versa. Another possible physiological role of the intestinal zonulin is protection against microorganism colonisation.24 In the absence of enteric infections, the mammalian small intestine is virtually sterile. Colonisation of the proximal gut by enteric microorganisms (even without apparent mucosal damage or elaboration of specific toxins) may lead to a leaky intestine25 but the mechanism(s) by which this disturbed physiological regulation of intestinal TJ permeability secondary to proximal bacterial contamination occurs remains unclear. We have recently provided evidence that both normal enteric bacterial flora isolates (well characterised for not harbouring any known pathogenic traits) and pathogenic bacteria induce alteration of TJ competency, as suggested by changes in epithelial resistance and increased passage of inulin.24 These changes were mirrored by concomitant expression of zonulin in organ culture systems and occurred even when bacteria were killed by gentamicin treatment.24 These results suggest that the presence of enteric microorganisms in the small intestine (but not in the colon, where the zonulin system is not operative15 18 19) induces a host dependent mucosal response that leads to luminal secretion of zonulin. The role of zonulin in bacteria induced impairment of intestinal barrier function is sustained by the observation that zonulin is detected in organ culture supernatants only when exposed to bacteria and by the blocking effect of zonulin inhibitors on these intestinal barrier changes.24 The fact that the interaction of bacteria with the intestinal mucosa induces zonulin release, irrespective of their pathogenic traits or viability, can be interpreted as a bacteria independent mechanism of defence of the host that reacts to the abnormal presence of microorganisms on the surface of the small intestine. Following zonulin induced opening of TJs, water is secreted into the intestinal lumen following hydrostatic pressure gradients19 and bacteria are “flushed out” from the small intestine. To determine if zonulin is perturbed during the acute phase of CD, intestinal tissues from patients with active CD and non-CD controls were probed for zonulin expression.27 Immunofluorescence analysis of CD tissues revealed increased zonulin expression within the intestinal submucosa with a characteristic reticular pattern that was consistently absent in control tissues.27 Quantitative immunoblotting of intestinal tissue lysates from active CD patients confirmed increased zonulin protein compared with control tissues.27 The TJ derangements in CD were more pronounced in villous enterocytes27 and therefore coincide with zonulin receptor distribution along the gastrointestinal tract.19 These findings suggest that this protein contributes to CD pathogenesis by increasing TJ permeability, typical of the early stages of this clinical condition. It has recently been reported that untreated CD predisposes to autoimmune disorders such as insulin dependent diabetes mellitus, Hashimoto's thyroiditis, autoimmune hepatitis, and connective tissue diseases.28 One could hypothesise that zonulin opens small intestinal TJs during the early stages of CD and permits entry of putative allergens into the intestinal submucosa where an autoimmune response is elicited. Alterations in intestinal TJ permeability have also been shown to be one of the preceding pathophysiological changes associated with the onset of type 1 diabetes.27 To establish whether zonulin may be responsible, at least in part, for these early changes, we used an established rat model of type 1 diabetes.29 Two genetic breeds (that is, BB/Wor diabetic prone and diabetic resistant rats) were studied to determine if they exhibited significant changes in intraluminal secretion of zonulin and intestinal permeability. No difference in intraluminal zonulin concentration was observed in the two groups of animals up to age 40 days.30 Thereafter, a fourfold increase in intraluminal zonulin was observed in diabetic prone rats while no significance increment was detected in diabetic resistant animals.30 This increase in intraluminal zonulin was found: (1) to be age related; (2) to be detectable only in the small intestine (that is, the jejunum and ileum) but not in the colon; (3) to correlate with an increase in intestinal permeability of the intestine; (4) to precede the onset of diabetes by at least 3–4 weeks; (5) to remain high in these diabetic prone rats; and (6) to correlate with progression towards full blown diabetes.30 Thus these results suggest that zonulin can be responsible for the early permeability changes (and therefore the pathogenesis of type 1 diabetes) already described in this animal model31 and confirmed by our studies. This hypothesis is further supported by the observation from both us30 and other investigators31 that intestinal permeability changes in these diabetic rates are confined to the small intestine, paralleling the regional distribution of the zonulin intestinal receptor19 and therefore of the site in which the zonulin system is operative. Zot was also tested in an in vivo primate model of diabetes mellitus. Insulin was intragastrically administered to diabetic monkeys either alone or in combination with increasing amounts of Zot. Oral coadministration of Zot and insulin decreased blood glucose levels in a dose dependent manner. Measurements of blood insulin levels revealed that insulin bioavailability increased from 5.4% in controls to 10.7% and 18% when Zot 2 μg/kg and 4 μg/kg were coadministered, respectively.34 Taken together, these results demonstrate that the permeating effect of the zonulin system also occurs in primates and that the kinetics and regional effects of this system are similar to those observed in the rabbit model. The paracellular pathway was once considered to be exclusively the route for passive unregulated passage of water, electrolytes, and small molecules. Its contribution to the general economy of transepithelial transports was therefore judged to be simply secondary to the active transcellular transport processes. It is now becoming apparent that the elements that govern this pathway (that is, TJs) are extremely dynamic structures involved in developmental, physiological, and pathological circumstances. An increased number of autoimmune diseases are now described whose pathogenesis is associated with a primary dysfunction of intestinal intercellular TJs. These same structures however are used to develop innovative strategies for the delivery of macromolecules normally not absorbed through the intestine. The discovery of the zonulin system has shed some light on the intricate pathophysiological regulation of intercellular TJs that, however, remains far from being completely addressed. It is conceivable that zonulin participates in the physiological regulation of intercellular TJs of the small intestine. Dysregulation of this conceptual zonulin model may contribute to disease states that involve disordered intercellular communication, including developmental and intestinal disorders leading to autoimmune disease (that is, CD and type 1 diabetes), tissue inflammation, malignant transformation, and metastasis. This same system can offer the opportunity of targeted tissue specific delivery of macromolecules and drugs currently engineered by recombinant DNA techniques or that will become available through the human genome project. Work in the author's laboratory is supported in part by the National Institute of Health grant DK-48373. (1977) The epithelial junction: bridge, gate and fence. Physiologist 20:10–18. (1989) Loosing tight junctions: lessons from the intestine. J Clin Invest 83:1089–1094. (1992) Evolution of ideas on the tight junction. in Tight junction. ed Cereijido M (CRC Press Inc, Boca Raton, Florida), p 1. (1978) Relationship between intercellular permeability and junction organization in the preimplantation mouse embryo. Dev Biol 67:214–224. (1976) Cell junctions in development with particular reference to the neural tube, Cold Spring Harbor Symposium. Quant Biol 40:443–455. (1978) Development of intercellular junctions in the pulmonary epithelium of the foetal lamb. J Cell Sci 32:307–324. (1976) The sertoli cell occluding junctions and gap junctions in mature and developing mammalian testis. Dev Biol 50:142–168. (1987) Structural basis for physiological regulations of paracellular pathways in intestinal epithelia. J Membr Biol 100:149–164. (1984) Alteration of tight junctional permeability in the rat parotid gland after isoproteranol stimulation. J Cell Biol 98:1865–1877. (1979) The surface epithelium of teleostean fish gills: Cellular and junctional adaptations of the chloride cell in relation to salt adaptation. J Cell Biol 80:96–117. (1986) The effect of neutrophil migration on epithelial permeability. J Cell Biol 103:2729–2738. (1988) The selective and superoxide-independent disruption of intestinal epithelial tight junctions during leukocyte transmigration. Lab Invest 59:531–537. (1988) Oxidants and conductance of cultured epithelial cell monolayers: inositol phospholipid hydrolysis. Am J Physiol 255(Cell Physiol 24):C781–C788. (1999) Cellular microbiology: can we learn cell physiology from microorganisms? Am J Physiol 276:C765–C776. (1991) Vibrio cholerae produces a second enterotoxin, which affects intestinal tight junctions. Proc Natl Acad Sci USA 88:5242–5246. (1991) Cloning of a gene (ZOT) encoding a new toxin produced by vibrio cholerae. Infect Immun 60:428–434. (1999) Expression of vibrio cholerae zonula occludens toxin and analysis of its subcellular localization. Microb Pathog 27:377–385. (1995) Zonula occludens toxin modulates tight junctions through protein kinase C-dependent actin reorganization, in vitro. J Clin Invest 96:710–720. (1997) The enterotoxic effect of zonula occludens toxin (Zot) on rabbit small intestine involves the paracellular pathway. Gastroenterology 112:839–846. (2001) Purification and preliminary characterization of the zonula occludens toxin receptor from human (CaCo2) and murine (IEC6) intestinal cell lines. FEMS Microbiol Lett 194:1–5. (1984) Partitioning of paracellular conductance along the ileal crypt-villus axis: a hypothesis based on structural analysis with detailed consideration of tight junction structure-function relationships. J Membr Biol 80:59–70. (2000) Human zonulin, a potential modulator of intestinal tight junctions. J Cell Sci 113:4435–4440. 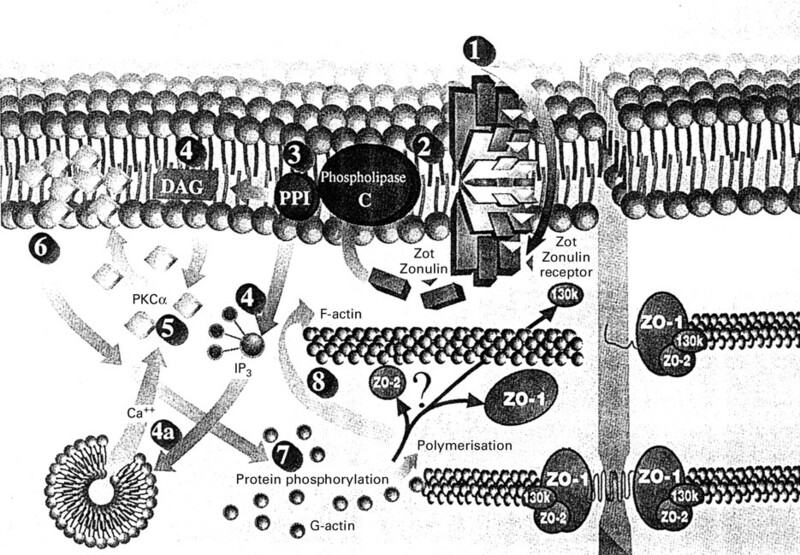 (2001) Regulation of intercellular tight junctions by zonula occludens toxin (Zot) and its eukaryotic analogue zonulin. Ann N Y Acad Sci 915:214–222. (2000) Zonulin is involved in the impairment of the gut barrier function following small intestinal bacterial colonization. Pediatr Res 47:960. (1993) Diet during rotavirus enteritis affects jejunal permeaility to macromolecules in suckling rats. Pediatr Res 33:548–553. Fasano A. Pathological and therapeutical implications of macromolecules passage through the tight junction. In: Cereijido M, Anderson J, eds. Tight junctions. Boca Raton, Florida: CRC Press (in press)..
(2000) Zonulin, a newly discovered modulator of intestinal permeability, and its expression in coeliac disease. Lancet 358:1518–1519. (1999) Duration of exposure to gluten and risk for autoimmune disorders in celiac patients. Gastroenterology 117:297–303. (1997) Modulation of intestinal tight junctions by zonula occludens toxin permits enteral administration of insulin and other macromolecules in an animal model. J Clin Invest 99:1158–1164. (2000) Alterations in zonulin secretion parallels changes in intestinal permeability and precede the onset of diabetes in BB/Wor diabetic rats. J Invest Med 48:184. (1999) Increased gastrointestinal permeability is an early lesion in the spontaneously diabetic BB rat. Am J Physiol 276:G951–G957. (1998) Innovative strategies for the oral delivery of drugs and macromolecules. Trends Biotechnol 16:152–157. (2000) Zonulin occludens toxin structure-function analysis: identification of active fragments and the receptor binding domain. J Invest Med 48:202. (2000) Utilizing the paracellular pathway: a novel approach for the delivery of oral insulin in diabetic rhesus macaques. J Invest Med 48:185.